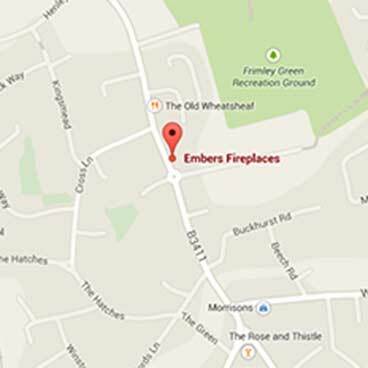 Embers Fireplaces is located in Frimley Green, near Camberley in Surrey. Our fireplace showroom is open six days a week Monday, Tuesday, Thursday, Friday, Sunday 10am - 4pm. Sign up to our mailing list using the form below. We will email you very occasionally with special offers, tips and information. We won’t share your contact details with anyone else. If you would like to speak to one of our engineers in more depth or technical aspects of an installation, you are more than welcome to meet him pleasebook a Saturday appointment here. We’re based in Frimley Green near Camberley, Guildford & Farnham, serving Surrey, Berkshire & Hampshire. Come and visit our showroom!